Very fun, very quick knit. I used some leftovers from my Evening Stockings for a Young Lady, and think I could make 2 more. 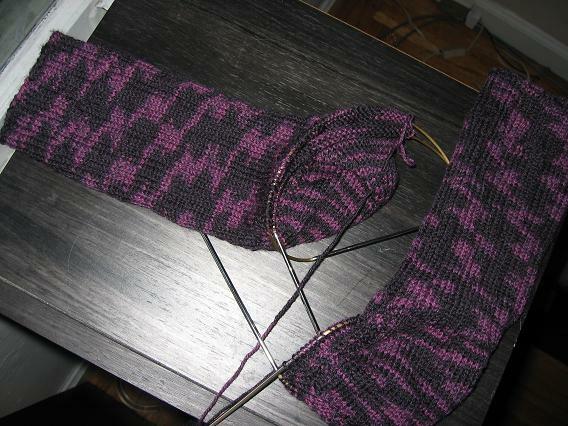 I will definitely look to this pattern again for leftover thin sock yarn, I like it a lot. I can see it being a really fun quick gift too. I used 8/0 beads since they're what I had on hand-- they are red with a metallic inside (I'm sure there's real terminology for this). This was my 1st time using a bead stringer (again, lack of terminology)-- it is SO much better than making my own out of wire since the "hole" the yarn is strung thru pops back open and doesn't just get flat to where I have to cut it off. This was my 1st time working crochet edging and though it worked, my "buttonholes" were a bit misaligned :) No matter, secret's just btw you me and the chickens, kay? I need to learn how to crochet... there's just too much cool stuff out there that I feel I'm missing out on. I love her short row heel, no wrap and turn AND no holes (really). I used it in the rpm pattern (thanks for all the comments, yall!)... 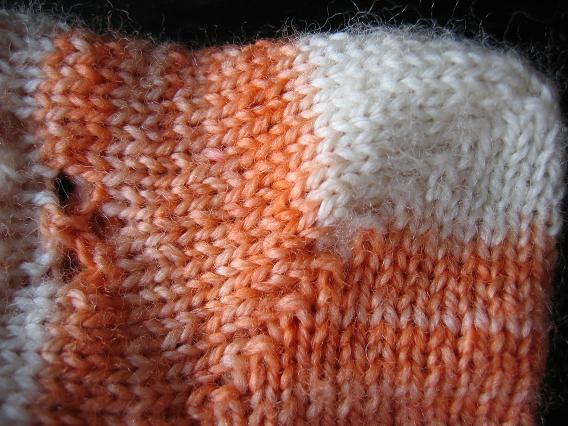 Purlwise has an EXCELLENT photo tutorial on how the heel yarnovers and stitches are worked, btw. 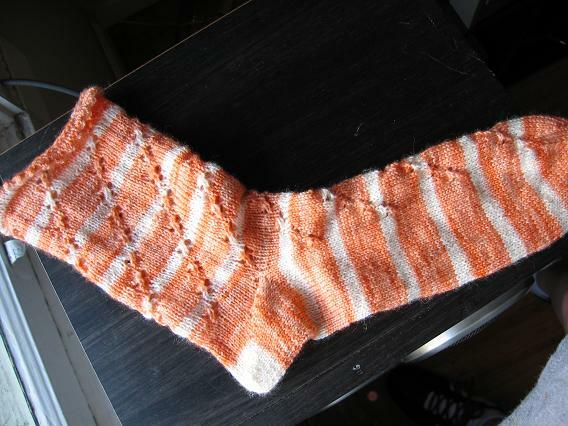 Yarrow Ribbed Sock from Knitting Vintage Socks. I'm glad I worked the heel for practice and its interesting, but I probably won't choose to work it again, I see a bit of a gap where the work is turned on the short row decreases (more pics if when I finish them). 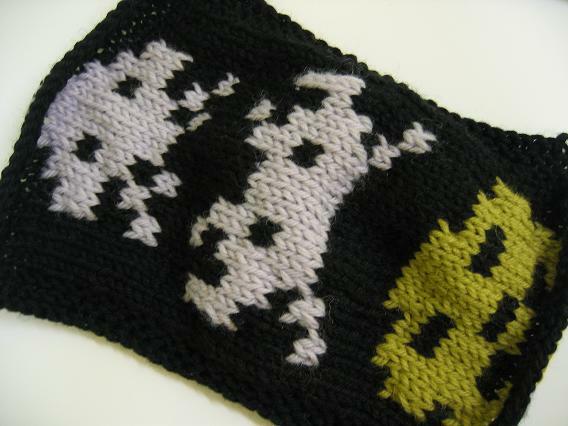 I was totally taken up with the idea of a felted postcard when I saw one on cpurl17's blog, and I've dug the space invaders scarf/chart for forever so it was a logical choice. :) I should have made my floats looser, not thinking they'd felt up tightly in the wash too (duh), but all in all I'm pretty happy. I took a hot iron to it on wool/steam setting and helped push down the edges (the "after" pic was actually before the hot iron treatment). The "card" ended up being about 6x8 or so. 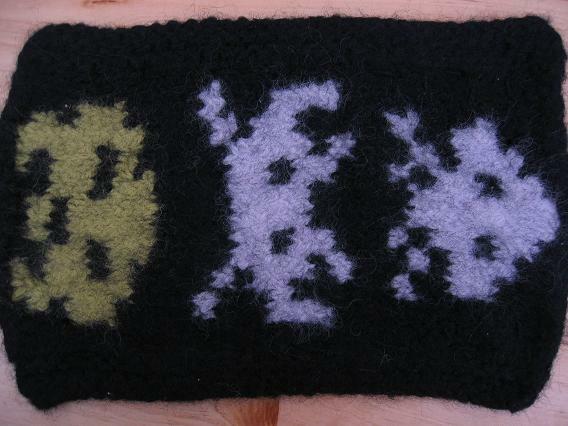 I knit the chart as written, knitting each 1st st for a garter st border. I went and picked up those side rows and knit 4 rows of garter st to help tamp down the curling, I should have done the same on the "top/bottom" of the chart as the colorwork pulled in differently there. 2 trips thru the washing machine on hot with some laundry did the trick, the WOTA felts up well. It could have used another, but I'm impatient. I used a bit of fusible interfacing on the backside to help the card hold some "stiffness" before I sewed the card part to it, I think it helped. It adhered well to the felted fabric, felted floats and all. 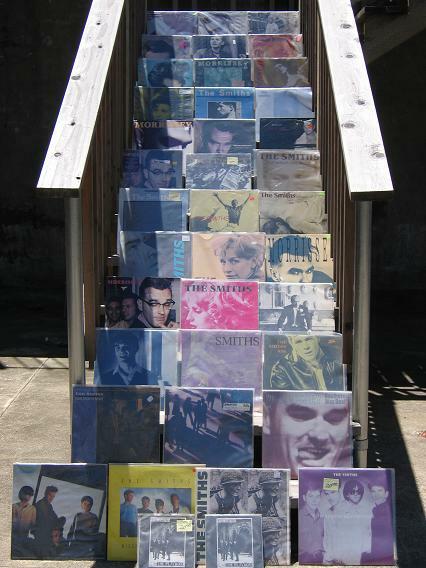 My favorites are the bootlegs (the idea of *bootleg VINYL* is so appealing to me, knowing what a pita it is to press vinyl in the first place) and the colored vinyl discs-- those ones are mainly imports, except for the purple "tomorrow" Morrissey single. and if it does come, will i still be human? Oy, teenage angst and the lyrics of *my* wonderful woman weekend. i remember, at the exact moment of sliding off the dog and cutting my hand, realizing that someday i would die. that everyone would die, and in that moment i knew exactly how huge and permanent death actually is. i felt for a second a bigness i still can't wrap my mind around, and started crying startled at the idea-- holding onto the dog's mane and weeping into his coarse fur with a bloodied hand. Perdita looks great, as do all the socks. Crochet isn't all that hard to learn. I'll admit to dabbling in it off and on. you have been a busy bee! everything looks great. Love the socks :) And perdita is so pretty! The socks are looking just awesome. You have been very busy! Great stuff, and congrats on the rpm socks! Woo hoo! So much knitting! I wish I had that much time.... It's all lovely. 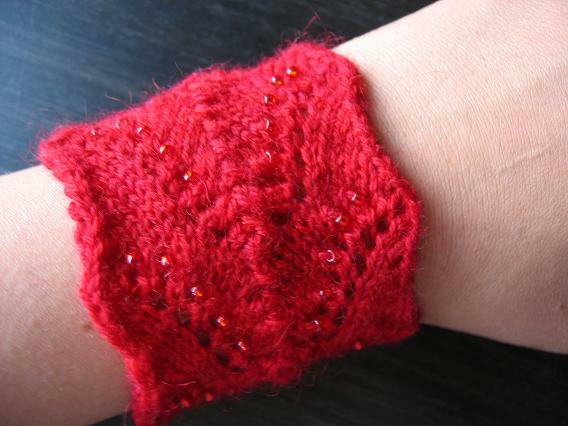 I totally understand your problems with getting red yarns to photograph well. I've used red-eye reducers, and that helps a bit. Nice work! Beautiful socks also, as usual. Crochet is easy, I did it for 30 years ... and now I'm into knitting. The DH calls it a "Fantastic obsession!" [I married a smart man] Love reading about your childhood memory ... as time goes on. I absolutely love those socks - the colors and pattern are great. Nice Opal socks and the felted wash cloth is very cool. I made the two sided scarf for my husband a couple years ago and it was well worth the effort. And I am in awe of your fabulous Moz vinyl collection. Yowza! Perdita is very cute, and the socks are so pretty. Ah, the Smiths. I haven't listened to them in ages, but when I was a teen, they were in heavy walkman rotation. wow, nice heel; i'm going to look that one up; i'm really happy with my own short-row sock heel, but am having a hard time finding one that is easy to teach to other people. it's a pretty detailed process and even demonstrating it is confusing for newbies! Love the orange cloverleafs -- striperfection! A knit postcard! What a great idea. Very cute! The socks, as always, look great! Perdita is lovely, and so are your socks. What a nifty idea, a felted postcard, it's great. You've been busy!! All of the pictures look great! Perdita is lovely, as are the socks. Those crocodil socks look really neat. Almost like self-patterning houndstooth! And I'm jealous of your Smiths vinyl collection, despite not owning a turntable either. Neat stuff, as usual! Wicked record collection. Your dye-swap yarn is cool! I have to try that pattern, too. I know that feeling. That "OMG Someday I'm going to die and be gone" feeling. I found it sometime after my grandmother passed. . .used to have panic attacks. Space Invaders - cool! And on a postcard too! Yay!!! Space Invaders!! My mom would get so mad whenever she found me sitting all zombie-eyed in front of that game...especially when she realized that this is what I meant by 'I'm doing math homework...' ;) Wikkid card and I LOVE the Perdita! Your socks are gorgeous! And I love Perdita - definitely worth learning to crochet for. 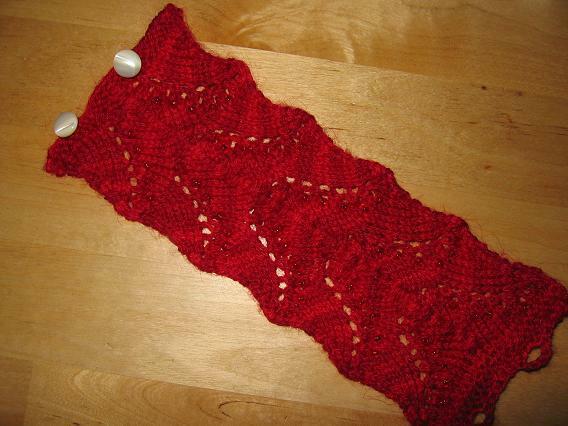 Also, RPM is next on my to-knit list, such an awesome pattern! Pretty heavy about the hand scar - it's amazing what we remember about certain events and how we look back at them later! YaY!! The Smiths (tick another one off for a Smiths-loving knitter). Perdita is gorgeous! You have given me inspiration to try the pattern out. Knit on! I don't knit, but your Smiths collection is definitely enviable. Nice Work!